I love anything with cinnamon and brown sugar, and these yummy treats are no exception. Serve these as a sweet treat or as a dessert when company comes over! Cut the cold butter into cubes so it is easier to mix in with a fork, and add it into your mixture (it’s okay if it stays in little pieces). Add milk slowly and bring the ingredients together into a ball of dough, add more flour if too sticky. Lightly grease a pie plate with melted butter, 12″ pie plate is best. In a separate bowl, mix together the brown sugar, granulated sugar and cinnamon. Roll about 1″ big dough balls and roll them in your sugar mixture to cover them completely. 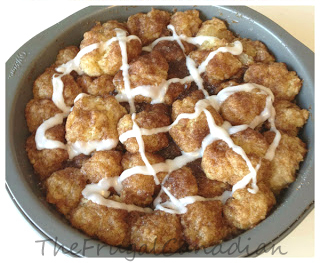 Add sugar covered dough balls to your pie plate. When all dough balls are completed drizzle the melted butter over them. Bake for 28 minutes or until done. Let your Mini Cinnamon Roll Bites cool before adding your glaze!